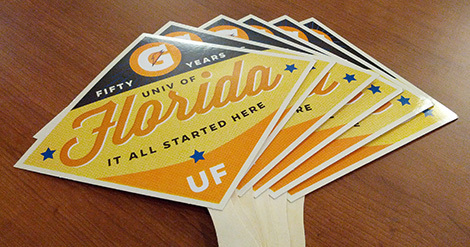 Gatorade is one of higher education's first and biggest tech transfer success stories, generating millions in revenue and royalties for UF, but more importantly its creation sparked an era of research at UF that continues to this day. 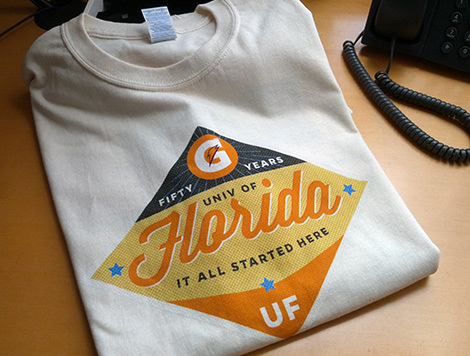 2015 was Gatorade's 50th anniversary, and UF worked with Pepsi Co and their Gatorade team to make the anniversary in October a celebration to remember. Because its creation was a interdisciplanry affair, the anniversary branding identity was purposefully designed to have 4 variations: logo badges that represented the Health Sciences, Athletics, the Gator Nation and UF itself. Working closely with Pepsi marketing allowed for the creation of a co-branded system where Gatorade and UF trademarks could live in harmony.